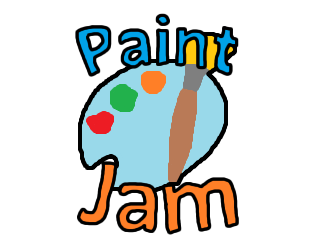 Welcome to Paint Jam 2018! Make all your own sound effects using only sounds you can make with your mouth. Onomatopoeia recommended. Only use the default MS Paint color palette. Try to make the title/logo without any real type/font. Draw all of your art with your eyes closed. Need a team? Head on over to our CrowdForge page! Head on over to the community if you have any questions, want to find a team, or just want to talk about Paint Jam! Follow @paint_jam or @YWainczak for any news or updates! Smash and platform through chunks of ice and escape from ice worms to steal eggs to eat! Sabiarts' Paint Jam 2018 submission! Defend the nature with Rob Boss! Screw the bees, eat those pies! You need a little light to show the Dark. As you find an empty cabin in the forest, you discover a gruesome secret. In a world where everybody is Bob Ross, become the richest of them all. Fetch Your Old Nana Some Beans! Type... To survive the ruin. Collect flowers as you fly through Wilderness Trail. Avoid the bees!